Fake artists still dominate Spotify ‘chill’ playlists. Now Universal is fighting back… with Apple Music. To refresh your memory: last summer, MBW extensively reported on reams of artists on Spotify who weren’t quite what they seemed. They were, in a very obvious sense, fake – pseudonyms created by songwriters and performers who, for some reason, didn’t wish to be identified on Spotify’s platform. Why didn’t these acts wish to be identified as their true selves? Spotify was playlisting every one of these tracks in key first-party lists such as Peaceful Piano (4.6m current followers), Deep Focus (2.8m), Sleep (2.8m), Music For Concentration (932k) and Ambient Chill (756k). We literally couldn’t find one track amongst them that hadn’t been playlisted by Spotify. As a result, these songs were each racking up hundreds of thousands or, in many cases, millions of streams. They exclusively appeared on Spotify and were nowhere to be found on other streaming services. Spotify pays out to labels and artists each month on a pro rata basis – ie. each rights-holder gets paid in line with their individual percentage of Spotify’s total stream volume. By racking up millions upon millions of streams, these ‘fake artists’ were claiming a significant, if small, percentage of these royalties. Stockholm-based production music house Epidemic Sound later admitted that its composers were behind the ‘fake artists’ – although its CEO, Oscar Höglund, objected to the term. He argued that the reason all (literally all!) of these tracks were being playlisted by Spotify was simply because they were “of a very high quality”. The suspicion amongst many senior music industry sources contacted by MBW was that Spotify was licensing these tracks from Epidemic Sound at a lower monetary rate than its typical deals with the major labels and Merlin. If true, this would have seen Spotify retain more money out of each month’s pro rata pot. In other words, it would have meant Spotify was improving its gross margin directly at the expense of labels and ‘non-fake’ artists. According to streaming analytics site ChartMetric, the biggest losers in all of this were non-fake ambient/electronic composers. For example, in February 2017, Spotify swapped out 16 tracks on its Ambient Chill playlist by the likes of Brian Eno, Jon Hopkins and Bibio for 28 songs connected to Epidemic Sound. Things haven’t gotten any better for the major labels: judging by ChartMetric stats analysed by MBW, over 90% of the tracks on Ambient Chill today (August 2) are under the names of fake artists. ChartMetric data suggests that only one major label – Universal Music Group – has a presence on the playlist, with just two tracks out of 71, equivalent to a 2.8% share. It’s the same story on Sleep, where UMG and Sony can claim only one track each out of 50 songs. And on Music For Concentration, amongst 80 tracks, Universal owns two while Warner and Sony have one each. But today, Universal, not to mention real ambient/electronic artists, appear to be fighting back. And they’re doing so exclusively with Apple Music. UMG has just announced what it’s calling ‘the first playlist brand to be co-created by Universal Music Group in conjunction with Apple Music… and artist ambassadors’. In other words, it’s not quite a third-party playlist, and it’s not quite a first-party playlist – it’s somewhere in between. 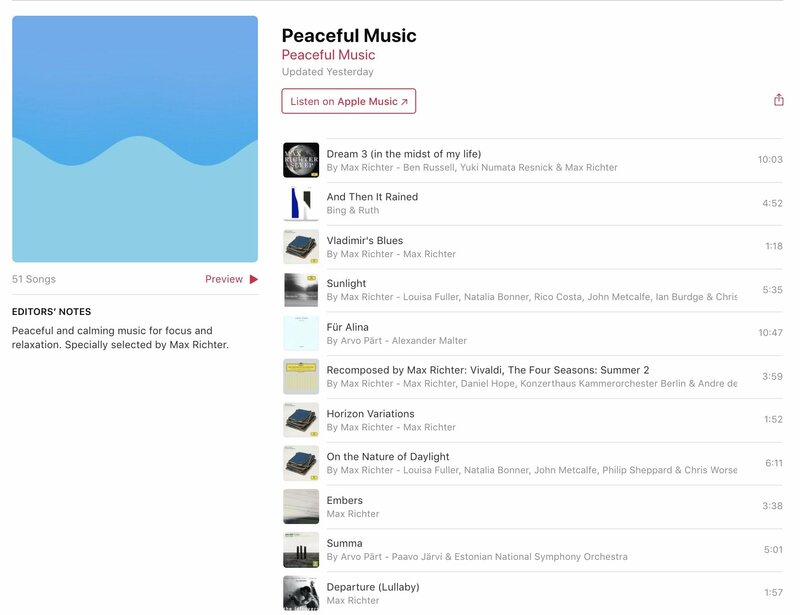 The skinny: Peaceful Music will be a collection of contemporary and calming music ‘specially curated by today’s leading composers and superstar artists of the genre’. Revered modern composer Max Richter will be the first artist ambassador to preside over Peaceful Music, ‘making expert selections to provide listeners moments of calm and inner focus’. Universal says that more ‘legendary and exciting names’ are due to ‘join the movement’ by curating/presenting the playlist in future. Presumably, they will all be real human beings. Check out why he’s doing it in the video below. Apple Music does already boast some ‘chill’ playlists of its own, including its sixth biggest playlist, Today’s Chill, the more dance-influenced Chill House (which, according to ChartMetric, is currently Apple’s 60th most popular playlist) and Piano Chill (at No.64). It will be interesting to see where Peaceful Music lands amongst this list – and whether the front-and-center presence of bona fide artists makes a difference to its popularity.